Multiple sequence alignment of the Br. melitensis, Ba. 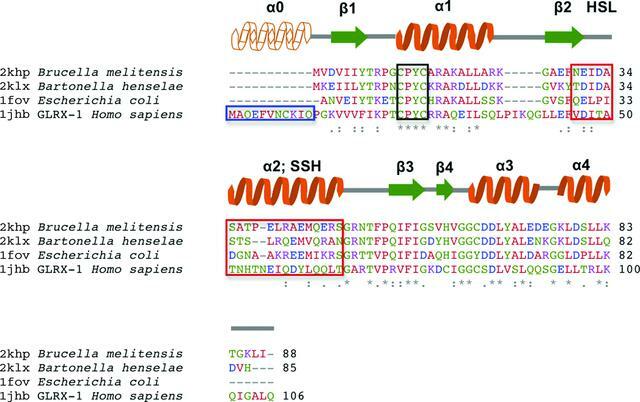 henselae and E. coli glutaredoxin 3 domains and the Homo sapiens glutaredoxin 1 domain. The black-boxed region indicates the conserved active-site residues shared with all dithiol GLXRs, while the red-boxed region highlights the human-specific loop 2 region (HSL2) and adjacent sequence-specific helix (SSH) region. The blue-boxed region is the additional N-terminal helix found in the human protein.